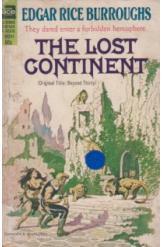 The Lost Continent Edgar Rice Burroughs Sci Fi. Book is in good condition, all pages intact. In the distant future, the eastern hemisphere has destroyed itself in war, the nations of Europe, Asia, and Africa reduced to mere legends. Now, after two hundred years of silence from across the ocean, a group of Americans set out to rediscover the long lost isle of Britain. Original title "Beyond Thirty."